"In the early morning you have balloon trip over Luxor. 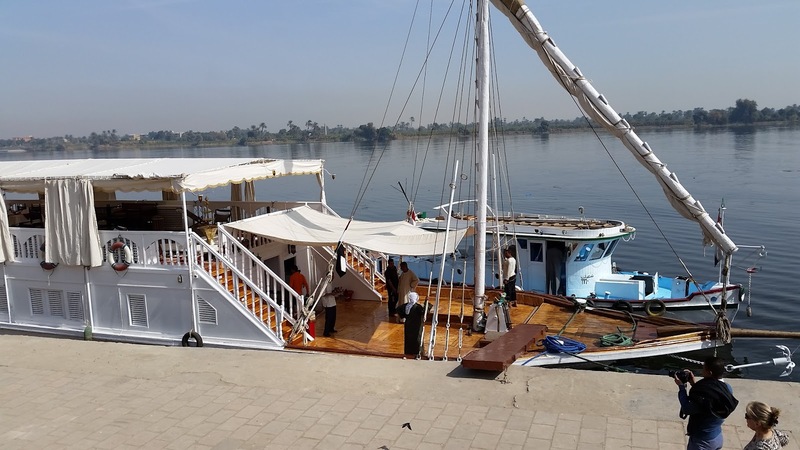 After breakfast our Car and guide will pick you up from your hotel and start our journey to Esna, crew will welcome you on board and have your bags taken to your cabins. We will then set sail on your voyage to Aswan. Overnight close to El Hegz Island"
As instructed, we were in the lobby by 6:00 AM, along with a few other hotel guests intent on a balloon ride over Lexor. Our ride didn't get there until almost 6:30. 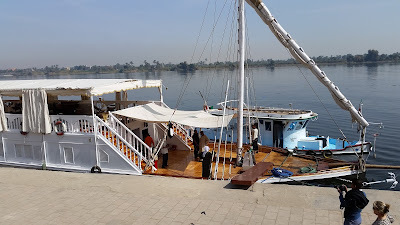 We were shuffled onto a crowded tourist van, transported to a Nile river taxi to get us over the river, then another tourist van to the launch site. The sun was well up in the sky by the time our balloon was inflated. Mohammed and Akhbar were coordinating logistics on the ground. One of the guests said she expected a sunrise ride. Mohammed explained that early fog this time of year meant there would not be a visible sunrise. I showed Mohammed the picture I took as we cleared the river (see above). He shrugged. I asked how many passengers would be in each basket - thinking it would be 5 or 6 like our prior balloon experience. He said 30-35. He then gave us a 30 second safety demonstration on how to prepare for a hard landing. I was beginning to have doubts about the whole deal. Mohammed and Akhbar in charge. Back to the Sofitel Winter Palace by 9 AM, said our fond farewells and checked out. Sigrid says she is never leaving. She wants to live in this hotel. Good to know in case we feel we need to make a major lifestyle change with our newly elected president. Ismael picks us up and we are off to Esna, where we will meet the dahabiya, crew, and fellow passengers who will accompany us for a 5 day cruise up the Nile to Aswan. But before we get there, I request one stop. I wasn't sure of the drinking arrangements on this cruise, so I asked to stop at Liquor store to pick up an emergency bottle of whiskey for medicinal purposes. Ismael found a store along the way. You won't believe the deal I got on this "Johnny Walker Black Label" or "Jani Water Black Labl" as translated into Egyptian. I just hope it doesn't blind me when I drink it. Finally we meet the Amoura - our home for the next five days. Think of a dahabiya as sailing barge. No engine, with large triangular sails on the bow and aft, it can only sail before the wind. It's accompanied by a towboat, which pulls the boat upwind or when there is no wind. I am accustomed to great trip planning from my wife, but she outdid herself this time. We have the aft suite with our own private deck. Since the boat is always towed from the front, we enjoy nothing but quiet while we drift down the Nile. As the sun set, the Amoura was under sail. So a few of us climbed aboard the towboat to take picture of the boat under sail. Sigrid may want to live in the Luxor Winter Palace, but I am going to move to the Amoura Dahabiya.